The wait is finally over! The long-anticipated 2020 Shelby GT500 was unveiled during the North American International Auto Show in Detroit this week. This new GT500 will be the most powerful street-legal coupe Ford has ever produced. This snake is coiled and ready to strike. 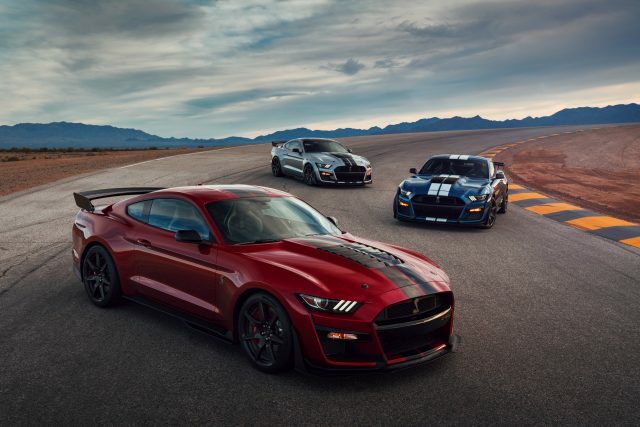 Spewing more horsepower than any GT500 ever, this new GT500 will be capable of sprinting from 0 to 60 in under three seconds and quarter mile finishes in under 11 seconds. These impressive numbers are courtesy of an exclusive powertrain combination designed to compete on the street, strip, and track. And with technology handed down from the GT and Mustang GT4, the new Shelby GT500 is the most advanced performance Mustang ever. The heart of this new GT500 is a 5.2-liter aluminum alloy engine crafted by hand. It works in conjunction with a 2.65-liter Eaton supercharger to help give this behemoth more than 700 horsepower. This powerplant is coupled to a computer-controlled TREMEC 7-speed dual-clutch automatic transmission. This transmission is capable of shifting in less than 100 milliseconds and is designed to run in several drive modes, including normal, sport, slippery, track, and drag. Other key ingredients to this winning formula include electronic power steering, lighter-weight coil springs, and MagneRide suspension. Michelin Pilot Sport 4S tires with 20-inch rims are offered on the base GT500 and Michelin Pilot Sport Cup 2 tires with 20-inch rims are available with the optional Carbon Fiber Track Package. Bringing all this power to a standstill requires an equally powerful braking system. Huge 16-5-inch two-piece rotors plus Brembo six-piston calipers provide plenty of stopping power when needed. Two handling packages will be offered for the Shelby GT500. A Handling Package consisting of adjustable strut top mounts and spoiler with Gurney flap will be available. For the extreme, a Carbon Fiber Track Package comes with 20-inch carbon fiber wheels, Michelin Pilot Sport Cup 2 tires, carbon fiber track wing, and splitter wickers with integrated dive plane. Availability for the 2020 Shelby GT500 is projected for this fall. Pricing has yet to be announced so check back with us later in the year for details.